Extensions and reconfigurations to an existing car showroom. An extension to showroom to allow for more new vehicle display and improved entrance that responds to the main highway. The existing entrance is currently hidden from view. A new service reception area with associated office accommodation. Again, this improves upon entrance clarity and forms a building that responds to the main highway. An extension to the workshop to the rear of the site, allowing for additional vehicle ramps and relocation of the valet area. 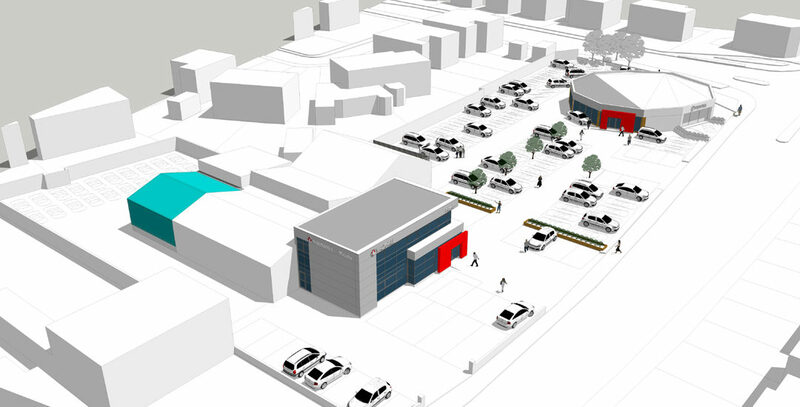 Loss of petrol forecourt and shop located the middle of the site acting as a divide between the two sides of the site. This allows for an increase in used vehicle display and vast improvement to the organisation of the site.